A celebratory atmosphere at City Hall before an intimate audience saw six council members sworn in making official the results of last November's council elections. MSV will have more on the dramatic shift breaking the 5-4 paradigm set back in the spring of 2009 and what it may mean for Hoboken's future. 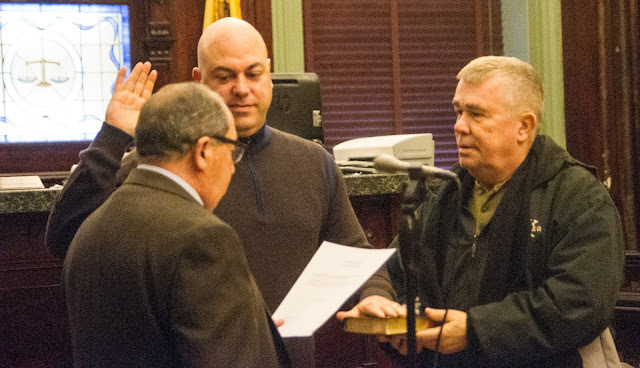 Presiding over the occasion, Hoboken City Clerk Jimmy Farina. 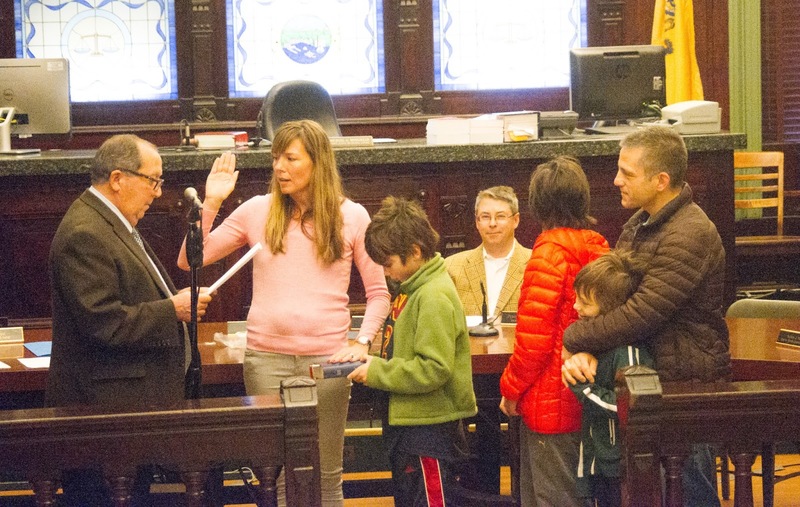 First ward Councilman Michael DeFusco takes the oath of office with his family looking on. Second ward Councilwoman Tiffanie Fisher saw her neighbor Emily lend a hand as she takes the oath making it official. Councilman Michael Russo is aided and abetted by his uncle, George DeStefano. 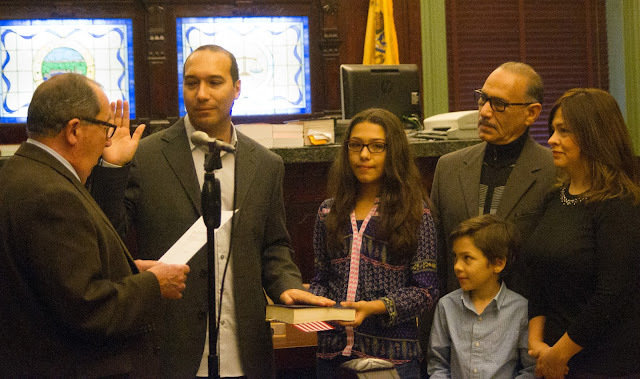 Fourth ward Councilman Ruben Ramos returns to the council with his family in attendance. 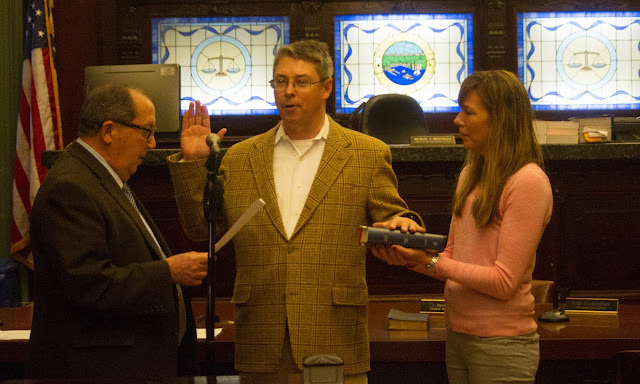 Councilman Peter Cunningham is sworn in as his council colleague Jen Giattino pitches in holding the Bible. Fifth ward Councilman Cunningham, Reform's anti-corruption champion will be serving in his third term. 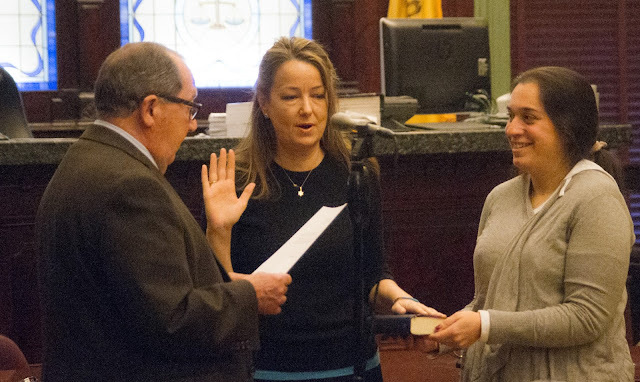 Sixth ward Councilwoman Jen Giattino took the oath with her family on the scene as City Clerk Jimmy Farina joked, "You broght the whole sixth ward with you." On Monday, we'll do it all over again for the benefit of the public before the 7:00 pm City Council meeting but this makes it official as they join their at-large colleagues: Ravi Bhalla, Dave Mello and Jim Doyle.